We love our straight allies. We need our straight allies. We welcome them with open arms. Pride season has so much mainstream momentum these days that the root message of queer liberation can easily drift away like a rainbow-shaped ballon untethered from its parade float. British newspaper the London Evening Standard is learning that lesson the hard way after a Pride feature hit newsstands to a less-than-stellar reception from many readers. 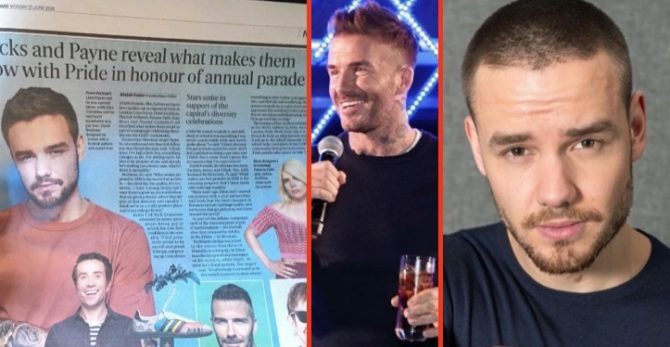 In the piece, titled “Becks and Payne reveal what makes them glow with Pride in honour of annual parade”, the voices of straight stars are featured more prominently than those of the LGBTQ interviewees. The next paragraph quotes Payne; the third, Beckham. Payne’s quote, a perfectly lovely sentiment, has virtually nothing to do with the struggle for LGBTQ folks to gain a footing in the world. Only then does the piece mention LGBTQ participants, out radio personality Nick Grimshaw and Elton John among them. GayStarNews shared some of the criticism the piece has received. Worth pointing out this campaign is raising money for the Albert Kennedy Trust, which is a brilliant cause helping tackle LGBTQ+ homelessness. But come onnnnnnn. The quotes alone tell you Liam Payne has nothing significant to say about the LGBTQ community. Queerty you need to stop, you do the exact same thing. why majority of the straight people you put on your site are on here, I don’t even know. People tend to forget that. Wow, what a F-ing prick hole and attention hypocrite, I mean whore.